Judy describes how a course of Flower Essence Therapy stopped this competition horse from repeatedly injuring herself, and turned her around from stubborn to wonderfully compliant. July 16th 2008 - I have been working with Vibrational (aka Flower) Essences for years now, and I am still awed by what they can do for us and our animal companions. Animals are especially responsive to essences, and can make enormous shifts very quickly. It is amazing that something so gentle, can be so powerful. (Remember, vibrational essences are completely safe - you cannot overdose and there are no so-called "side effects"). As Apache Dancer's case illustrates, Vibrational Essences can even help animals who seem to have ingrained, inbred personality imbalances. Nationally-known horse trainer/body worker Diana Thompson referred Apache Dancer to me because she had many physical problems which were not getting better. It was believed that her physical problems were a result of emotional and personality issues. Apache Dancer was a 13-year-old Apaloosa mare. April had bred Dancer for Eventing. 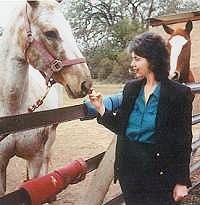 The horse lived on April's property, within a large corral and with another companion horse. Apache had the best of everything - a single, caring owner, lots of attention, and the kind of competitive training and activities she was good at and enjoyed. April noted that Dancer was very athletic and capable. Her competitive nature was part of being an Apaloosa - but Dancer took competitiveness to an unhealthy extreme. 1.) Stiff in her body: Dancer was physically tight and rigid. She was misaligned in her hips, back and all through her body, and was always in pain. She was short-strided in her hindquarters. 2.) Stiff and rigid mind: Though she loved competing Dancer routinely refused to respond to training techniques and exercises. She simply would not take direction from anyone. Instead, she would "always take the hard way". 3.) Insisted on getting her way; extreme jealousy: Dancer manifested self-destructive behavior in attempts to get her way. If another horse was being worked, for example, Dancer would kick at the fence to the point of injuring herself. She also re-injured her hips in her insistence on doing things her way. In addition, she was known to hold grudges. 4.) Swollen ovaries: she had a possible cyst, and was very late and irregular coming into heat. 5.) Easily distracted: Dancer would watch everything in the environment, rather than focusing on her work. 6.) "Childish dependency": Dancer was always making inappropriate demands for attention. For example, she would gallop in circles and buck around April when April was leading her other horse out for work. 7.) Unpredictable, insecure, stubborn, upset, worried, desperate and in pain. In addition to chiropractic care and bodywork, Diana Thompson had also administered Bach Flower Essences, to no avail. Frustrated and concerned, Diana was hoping that a more sophisticated approach to essences might be helpful, so she asked me to try. FES Fairy Lantern: to address her immaturity, neediness, and childish dependency. Senita Cactus (Desert Alchemy): for releasing old perspectives that keep one locked into unsettling emotions. 2)	Much more pliant and flexible. 1)	Still hanging on to doing things the way they've always been done - the way she thinks it "should be". 3)	Still self-destructive when she doesn't get her way. Alaskan Northern Lights: for being on the verge of a major shift in consciousness, but needing a catalyst to actually make the shift. Ancient Sight (Source, Nature, Soul Essences): for inherited imbalances that she came into the world with. Master's Grape: for feeling unloved; for resolving old abandonment issues. FINAL RESULTS: Dancer took the Grape for a full month. April reported in our follow-up that Dancer has been "fabulous - calmer than my other horse. Not frantic or desperate, and willing to tune in to me. She is unbelievably obedient. No self-destructive behavior." "Dancer has been sterling. Before, she was super, super hyper before she would settle. Now, it's 'OK, what do you want me to do?' It scares me how good she is - she's very steady and not spooky - even after not being ridden for a week. She's not reactive. It's amazing - so good it's frightening! She was unpredictable, insecure, stubborn and in pain - now we can lead her to where she can feel better." Judy Aizuss, M.S., is an essence practitioner, psychotherapist, spiritual counselor/coach, and former dog trainer. She began using vibrational essences in 1983, and currently uses 900 essences from companies around the world to assist animals - and their people - with their next steps in growth. Consults are in person or by phone. For appointments/information call (415) 459-2383 or e-mail judy@essentialhealingbyjudy.com.